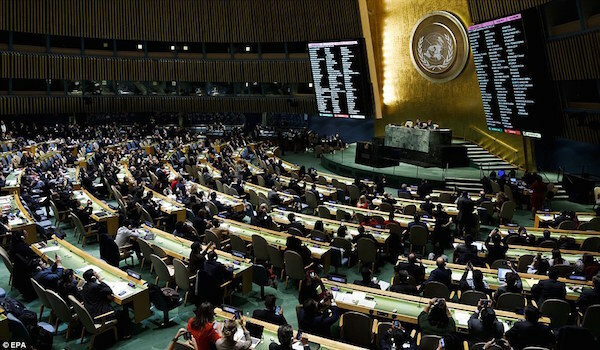 The UN General Assembly (UNGA) on Thursday voted overwhelmingly to condemn Donald Trump’s decision to declare Jerusalem as Israeli’s capital. UN Votes: 128 in favor; 9 against; 35 abstentions. This came despite the US President’s threat to cut billions of dollars in aid to countries that dared to defy him. 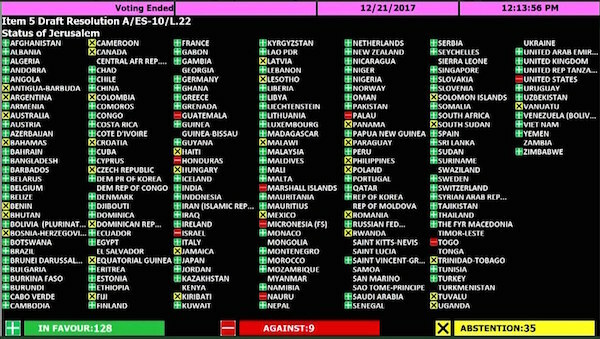 Member States in the UNGA “demanded” that all countries comply with Security Council resolutions regarding the status of Jerusalem. The countries in green all voted against America, exercising their right as a sovereign nation. Seven countries – Guatemala, Honduras, Togo, Micronesia, Nauru, Palau and the Marshall Islands – joined Israel and the United States in opposing the measure. ‘The United States will remember this day,’ US Ambassador Nikki Haley told the assembly. ‘America will put our embassy in Jerusalem,’ Haley said. ‘No vote in the United Nations will make any difference on that. ‘But this vote will make a difference on how Americans look at the UN and on how we look at countries who disrespect us in the UN,’ she said.